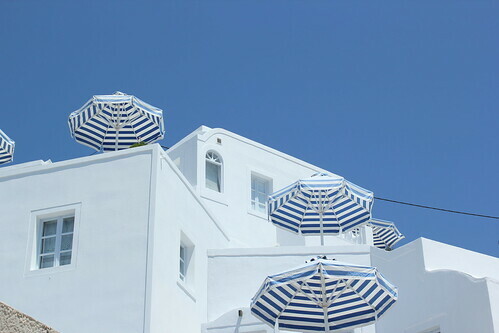 I hadn’t always wanted to go to Santorini, but after stumbling across it on a last minute holiday search, seeing the pictures and reading all about it, my heart was set. Even though it meant lowering our standards in terms of the accommodation (bad reviews and no air conditioning) in order to be able to afford to go, I just had to go and my poor boyfriend didn’t get much of a say in the matter! He soon got over it, and we had an AMAZING time – it truly must be one of the most beautiful places in the world (I haven’t been that many places to compare though)… we fell in love with the scenery, people and the food! 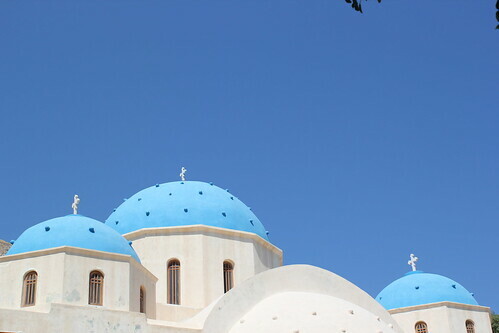 Yammas to Santorini! 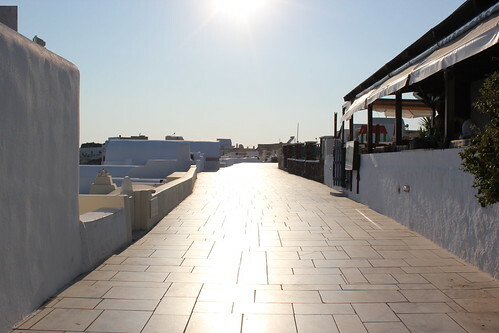 Oia… where the streets are paved with gold (well marble, but doesn’t it look like gold on this picture?! )… It’s definitely the most beautiful man made part of the island. People in the know where white, the buildings are white and built into the cliffs… a truly stunning and magical place. 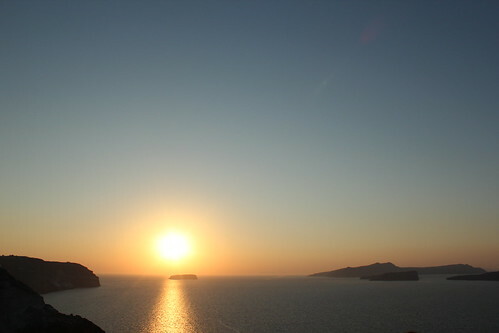 It’s also an expensive place, so before we went we decided not to eat there, just watch the sunset and go back to good value Perissa where we were staying. Its a popular place, and lots (and lots) of people want to watch the ‘magical’ sunset… we didn’t like being squished up against everyone else so as soon as we saw the perfect seat looking out onto the sunset we decided that we could afford to have a meal. 125 Euros later (compare to 30/40 euros for same in Perissa) we had watched an amazing sunset and had an average meal. Great experience though, and I would recommend anyone to visit. 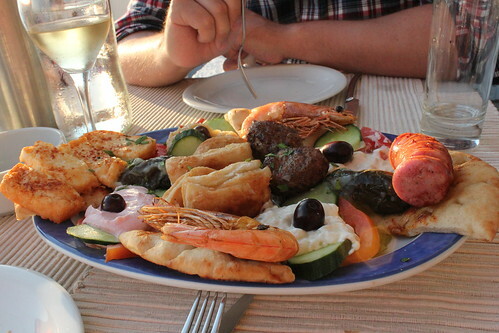 The highlight of the meal was the mixed mezze starter with halloumi, sausage, pastries, meatballs, prawns, pitta, hoummous, taramasalata, stuffed vine leaves and salad. 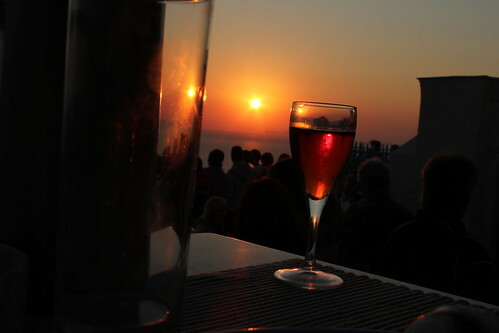 A glass of Vinsanto (Santorini’s sweet dessert wine) finished off our meal as we watch the beautiful Oia sunset. 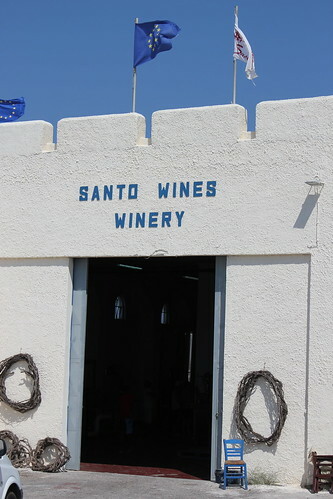 We took a trip to the Santo Wines Winery, which is a cooperative for local wine growers. We were too hot to stay long but had a look at the vines, the view and had a good look around the air conditioned shop. Grapes grown in Santorini are grown on special vines that shelter from the island’s strong winds by growing close to the ground. 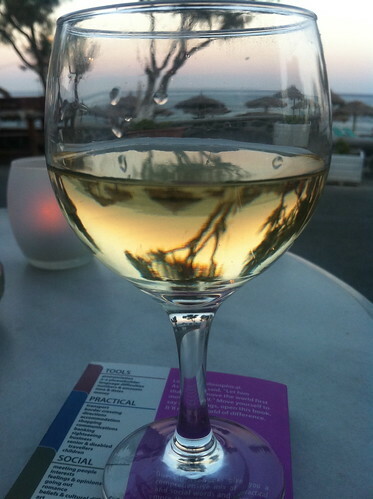 ‘Village wine’ can be bought very cheaply by the litre in supermarkets and by the carafe in restaurants. It is quite acidic but lovely in moderation! 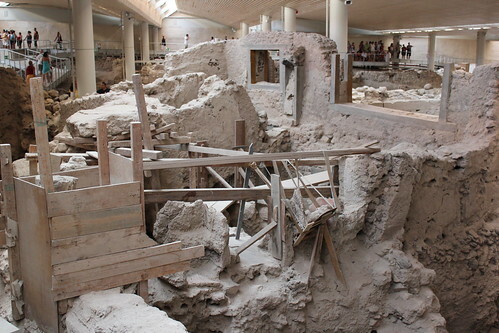 Ancient Akrotiri is over 3,500 years old, a city evacuated before Santorini suffered the most spectacular of volcanic eruptions, with ash from the explosion found so far away as California and those in the UK able to hear its blast. Lava flowed through the streets of the impressively advanced metropolis, preserving its streets, houses, even it’s drainage systems. Taking a tour of the climate controlled archeological site is awe inspiring, and apparently they have only uncovered a very small part of the buried city. 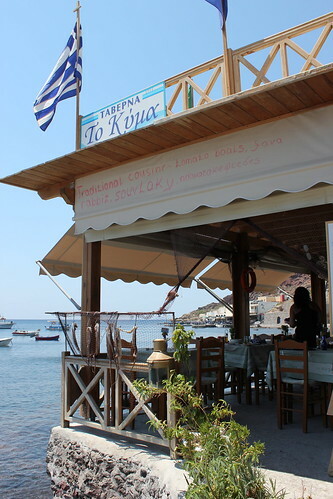 After our tour of ancient Akrotiri, we walked down to the seafront, where we found a lovely row of fish tavernas – perfect timing as we were hungry for lunch. 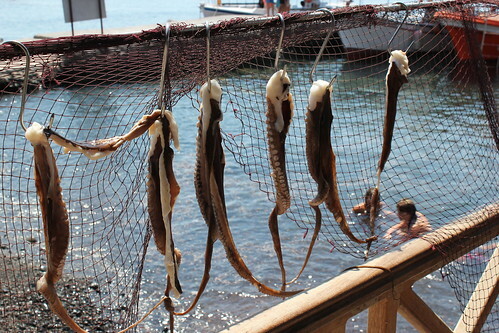 We picked the one furthest along the coastline, where the seating area jutted out into the sea and octopus legs were strung up to dry in the sun. We couldn’t work out if the octopus was on the menu so went for a few safer different dishes to share. 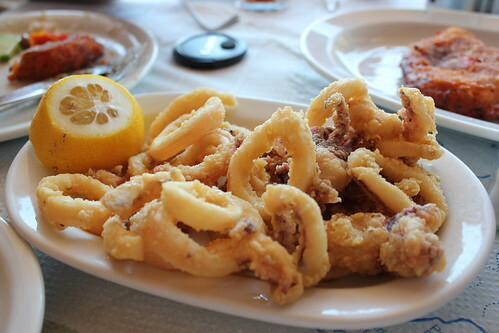 We started with calamari which was so fresh, crispy and tender. 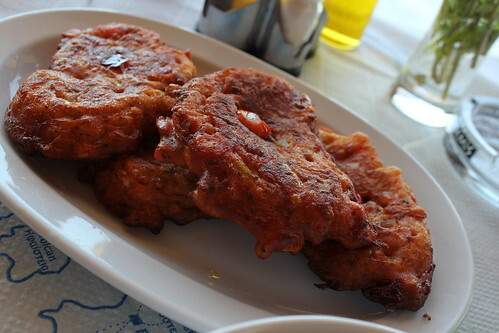 Tomato balls, or fritters, are a santorini speciality. You may have heard of Santorini cherry tomatoes which are awaiting PDO status… I’ve had ‘Santini’ tomatoes from M&S which I think have been grown to mimic the sweet, full flavoured Santorini cherry tomatoes. We tried a few different versions of these delicious tomato balls, and armed with a few tips from our hotel owner Sandy, I’m going to have a go at making my own. Watch out for a future post when I have time! The old lady serving us brought us out this little aubergine based dish, as a free little extra. 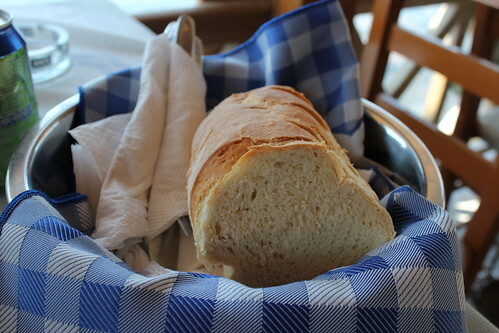 We made lots of effort to speak greek so I think we was thanking us with food – we were happy to accept, it was delicious! 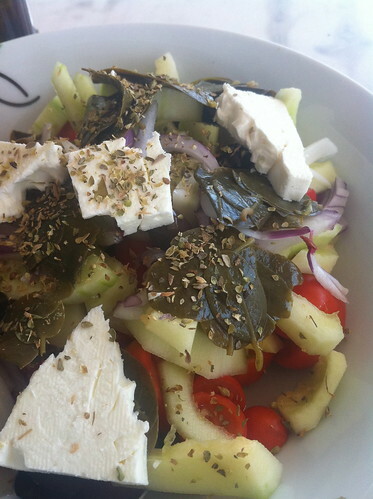 We had quite a few greek salads over the week, this one particularly generous with feta. 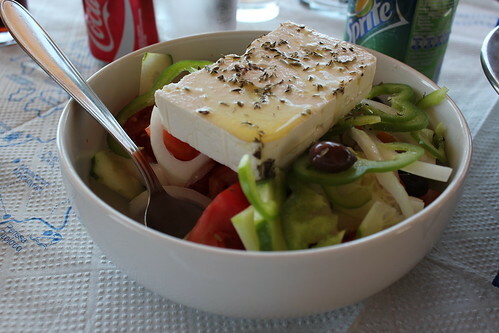 We also had a few Santorini salads which use the native cherry tomatoes, their special sweet cucumbers and caper leaves, another local speciality. 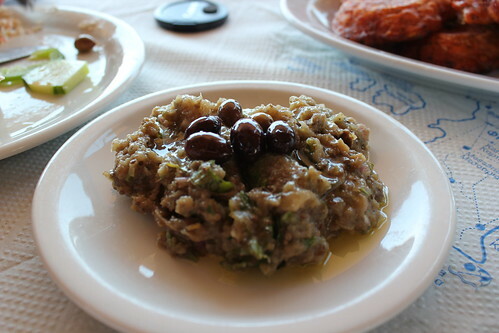 While on the subject of local specialities, we also tried Santorini’s fava beans, which do have official PDO status. 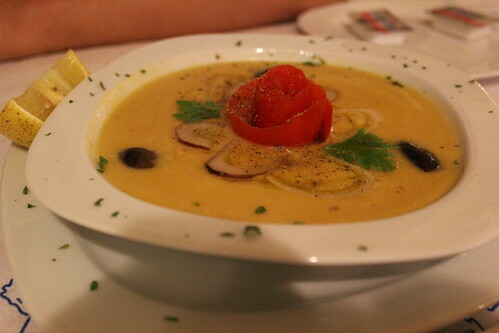 They are served like hummus, but have the texture of dahl – we tried two versions which were both delicious. 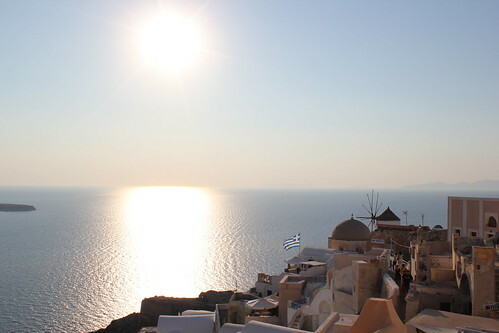 The food in Santorini was delicious, great value and inspiring… but the scenery, buildings and views were incredible. Here are a few of my favourite pictures, if you want to see more take a look at my flikr page. 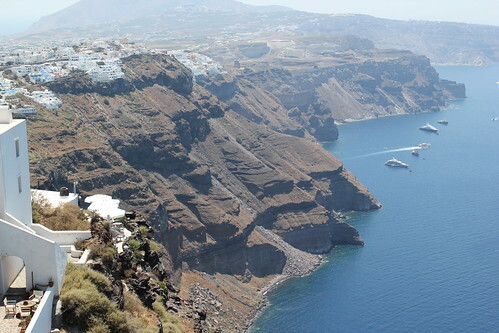 Have you been to Santorini? If not, does this post make you want to go?